Oh, for the love of all things holy, thank goodness! It’s finally done. Well, alright, the muslin is done, at any rate. 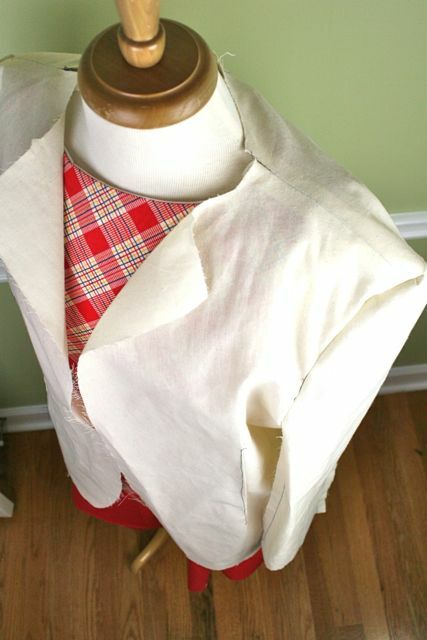 This is the shell of the jacket–it doesn’t include the collar or the collar stand, and I’ve left off the facings at this stage. I was really most interested in working on the overall shape and the fit of the sleeves and body. 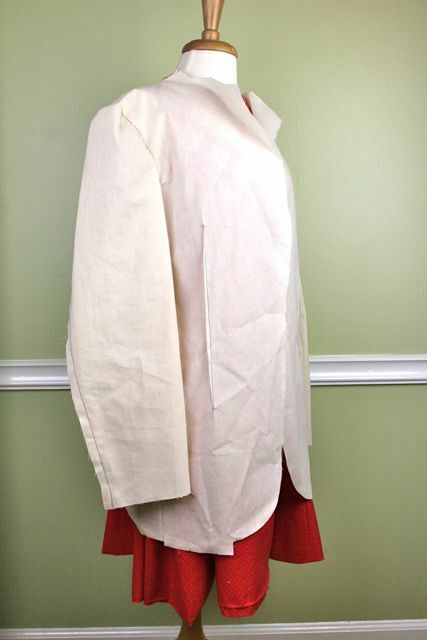 I’ll add the collar and facings when I construct the jacket from the fashion fabric, after I’ve had a chance to put this on my husband and verify that it really looks and hangs the way we both want it to. Here you see it modeled on my dress form, with a mostly-finished-and-just-lacking-the-hem-stitches dress beneath it. I was going to take the dress off and show the jacket muslin alone, but I kinda liked the on-a-date-and-it’s-chilly-tonight-oh-aren’t-you-chivalrous-to-share-your-coat look that’s happening here. Gotta get my giggles where I can. 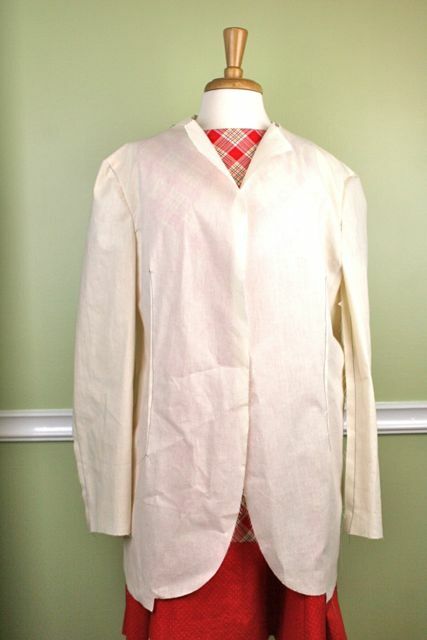 I used a black thread and a basting stitch to assemble the entire muslin. 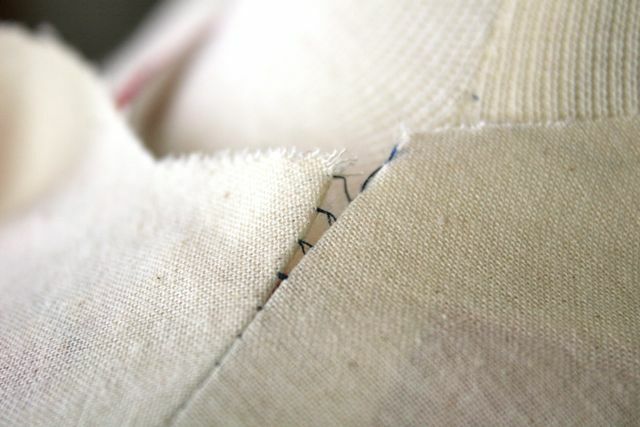 Using the basting stitch–my longest straight stitch–meant that the sewing went faster and will pull out more easily. That way, I can make adjustments when I fit it, or disassemble the entire thing with very little effort. I made the mistake of putting the sleeves in on the wrong sides, which irked me, but since they’re inside out (meaning they’re facing forward, just on the wrong sides) I left it and moved ahead. This project was meant to be complete back at the end of Sept and it’s now pushing the middle of December, so I’d like to move ahead and quickly as I reasonably can. Next step, I fit this on my husband (which I’ve already done but will share in a separate post). Any adjustments had to be recorded, and a lot of questions answered about the correct way to fit a men’s jacket–be it blazer, sport coat or suit jacket. From there, I have a whole new set of fabrics to evaluate, since it’s far too freezing out there to make this out of linen as originally planned. Sigh. The price of procrastination. Wish me luck on the next stage! Just a few more days until Christmas–eek!